Town Of Franklin Resource Guide to Businesses, History, Kate Mountain Park,Recreational Activities, Real Estate and Lodging Guide. As we enter the Internet world, events of the past become life-size once again. Our thoughts go to the very early days and the founding of "Our Town", the Town of Franklin on May 26, 1836, which was originally a part of the Town of Bellmont, all within the county of Franklin in New York State. Constable, Highway Superintendent, and Fire Code and Building Code Inspector. Board meetings were held at prescribed times and places. At the present time Board meetings are held on the second Monday of every month. The Town of Franklin is the third largest town in the county of Franklin containing 108,416 acres (equaling 180 square miles) with 70.3 miles of Town-owned roads to maintain. It would be reasonable to assume that the number of miles of town roads increased over the years to the present day as population increased. In fact, the population has over the past few years, winter maintenance, plowing and sanding, is provided by the town for 28.3 miles of county roads. Highway maintenance was and still is one of the Towns most needed and greatest expense. As early as 1851, the Town was divided into districts under the supervision of a Commissioner of Highways, who was Thomas Goldsmith. Each district was headed by its own Overseer of Highways serving under the Commissioner. Road warrants were drawn up for the purpose of upkeep of the roads. Each district assessed the inhabitants of that particular district for the required manpower to maintain the roads throughout the year. Penalties were imposed on all persons having neglected or refused to work out their highway assessments. Over the years, this practice changed and a regular highway department with highway employees developed. Prior to the establishment of the Town of Franklin in 1836, the settlement of Franklin Falls in 1827 was operating a sawmill and forge. A catastrophic fire in 1852, reduced the area to ashes. Very little remains of this early settlement except the hydra-electric plant of the former utility company, Paul Smith Electric Light, Power and Railroad Company, which was sold to Niagara Mohawk Power Corporation. The area known as Merrillsville was settled in 1829 by Lamsons, Cates and Merrills. Some of the early buildings are still standing today. The John R. Merrill Inn was a famous stopover for the stagecoaches. 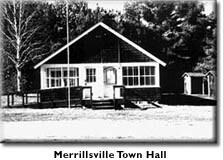 The existing Merrillsville Town Hall (a former Merrill Cure Cottage for tuberculosis) was purchased from the Merrill family by the Town of Franklin in 1920 and moved to its present site. This former Merrill Cure Cottage is used today as a voting and caucus district. After a lengthy process, The Merrillsville Town Hall has been placed on the National Register of Historic Places as of September 15, 1995. As is known, the National Register is the nation's official list of properties worthy of preservation. Listing on the National Register recognizes the importance of these properties to the history of our country and provides them with a measure of protection. The Hopkinton and Port Kent Turnpike, the major artery, was under construction from 1829 to 1832. Cedar mileposts were set along the entire route with numbers cut into the wood. The entire route is currently maintained. The Town of Franklin boasted of a black population as early as 1846, resulting from the efforts of Gerrit Smith (abolitionist) to resettle former slaves. Many Civil War veterans brought slaves home with them to further the cause of freedom and help them find homes. The local cemeteries contain many of their names. Volumes have been written about Loon Lake House (Loon Lake Hotel Company) and its unforgettable founders, Ferd and Mary H. H. Chase, who touched the lives of so many people in different ways. The incredible success of the Chase management was due, in part, to their keen business acumen. Mrs. Chase was affectionately known as the "Mrs" who died on January 18, 1933. The great depression of 1929 took its toll on the Loon Lake House and forced it into bankruptcy during late 1931. One of the main attractions at Loon Lake was the 18-hole PGA golf course. A devastating fire of September 20, 1956, burned this famous hotel to the ground. Two railroads, namely the Delaware and Hudson and the New York Central served this area after the 1870's. The service was curtailed around 1968. Eight regular daily trains, plus freight trains were routed through these lines. Many of the large, well known inns and hotels have since fallen into disuse as a result of readily available motor and air transportation. Onchiota, established in the late 1800's, was a mill town with a general store and the only phone in town. In July 1903, property on Clear Pond, which was near Onchiota, was purchased by Paul C. Ransom who established the Adirondack-Florida School for boys. World War II brought changes and the northern campus was closed in 1949. The buildings were later sold and are now used as private homes. 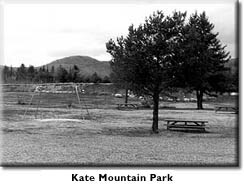 The hamlet of Vermontville was settled by men from the neighboring state of Vermont in the early 1800's as far as available records indicate. The first postmaster, Josiah J. Alexander was appointed on March 31, 1854. Today, the governing body of the Town of Franklin is located Vermontville, N. Y. The one and two-room schools that dotted the town are now closed and students travel by bus to a centralized school district in Saranac Lake. In early times, students walked in all kinds of weather, as there were no buses. Merrillsville Methodist Church, Merrillsville was established in 1894 and taken down in 1947, as members declined and it was no longer needed. St. Paul's Episcopal Church, Vermontville began at the turn of the century and has been inactive since the 1970's. It was sold in 1993 to a business. The former Wesleyan Methodist Church, Vermontville was in existence in 1849 and later sold to the Methodist Episcopal Church, Vermontville in 1895. When it was no longer needed in Vermontville, it was consolidated with Bloomingdale United Methodist Church March 10,1966. 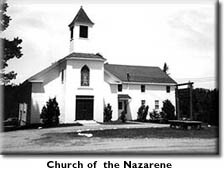 The building was sold to the Vermontville Nazarene Church on August 18, 1966, and is presently active. St. Rose Church, Alder Brook was erected in 1854 and destroyed by fire on December 8, 1924. The Loon Lake Church Jewish Center, on old route 99 in Loon Lake. Open July through Labor day. The Town of Franklin has celebrated the founding of the town each year since 1986, which was the sesquicentennial (100 years), with displays, craft tables, games, naming a king and queen and an evening square dance.